When it comes to designing and creating an exhibition, the flooring can often fall to the bottom of the pile. Many business directors do not even consider what exhibition flooring they are going to opt for, until all other elements of the exhibition have been sorted. The result? Flooring that simply doesn’t make the exhibition look its best. Here at Conex though, we’re experts in creating temporary walling and know just what it takes to make an exhibition look completely fantastic. Whether you opt for a smart and sophisticated exhibition flooring option, or you go for a more daring look, you can choose an exhibition with Conex Temporary Walling Systems to fit the occasion precisely. Let us make your exhibition one to remember! Think cutting-edge modern business flooring for a technology company to wedding exhibition flooring, covered in confetti! 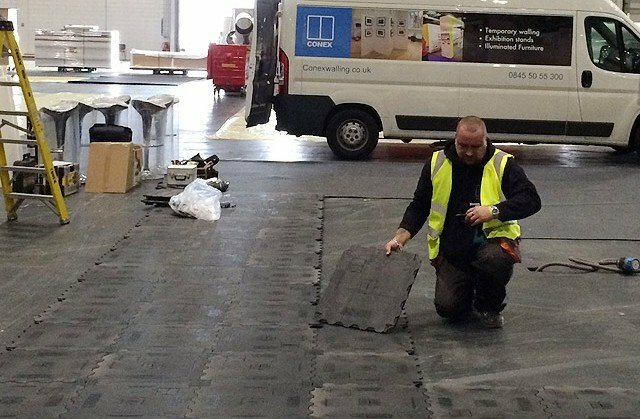 Take a look at the following top 5 tips from Conex Exhibitions to make sure your business’ exhibition flooring is looking tip top! The key to the perfect exhibition is perfect planning. From how the exhibition is going to look, to logistics on the day. Investing time before you come to present your exhibition is the absolute key to getting it right. That’s not to say you need endless boardroom meetings deliberating over the best background colour to frame your promotional poster, it simply means getting the main points of the exhibition covered so that each member of the team knows exactly what they should be doing and when. Arrange 1-3 meetings and draft up an agenda for each. In the last meeting, you should decide on which exhibition floor you will be hiring. Make sure you consider the venue for your exhibition and hire the exhibition floor accordingly. There is nothing worse than getting the theme of your venue wrong and making a ghastly choice of flooring. Pretend grass outdoors, for example, or a luminous floor tile pattern in a brightly lit indoor environment. Before considering the exhibit flooring you should consider the minor details, check out the venue beforehand and discover where your pitch will be (yours may be unexpectedly outside for example!). Once you have planned the majority of your exhibition, considered the venue and are confident in your decisions, you can finally make the choice on which exhibition flooring you’d like. Choose from various flooring hire options including exhibition flooring tiles, temporary vinyl flooring, raised exhibition flooring, carpet, artificial grass, laminate and more with Conex Temporary Walling Systems. We’re happy to help if you need any advice! No doubt the type of exhibition display flooring you choose will depend on the budget of your business. While it is true that the exhibition floor is low on the priority list when allocating the budget, it is still a piece of the puzzle that should most definitely be considered. Depending on how well you’ve planned your team, you may not need professional help to erect your exhibition. However, there are huge advantages to having a team of trained and skilled staff to put up and take down your exhibition. Saving time is obviously a huge benefit to having the exhibition professionally built. Your budget may also help inform your decision as to whether you’ll hire a professional team to help. Perhaps those on a stricter budget would prefer to put up the temporary walling themselves. It is worth considering, for medium-sized businesses, that professional installers may save time spent on your own staff to put up the exhibition. Perhaps you could call further staff in once your walls are up and ready to go? Here at Conex Temporary Walling Systems, we are exhibition experts and have worked with a variety of businesses over the years. We can help you decide on the most suitable exhibition flooring for your next exhibition.